I got to chat a while back with a long-time direct student of Henry Copeland - one of my favorite people and teachers of all time. I haven't gotten to see or play with Henry in quite a while, so we reminisced about what a mind- and practice-altering experience it is to lay hands on Henry or to sit at his feet and listen. Don't fight sideways - that is, avoid applying power in any plane except that one defined by tori's midsaggital line - basically only push or pull straight forward or backward. Never stop moving long enough to hit uke - This is most visible in jo work and in sword disarms, but it applies directly to how Henry does all of his aikido and judo. Basically, anytime you stop moving (even if it is just momentarily) you lose all your momentum that you've built up and you have to start over. Plus, that momentary stop is a chance for uke to get a shot in. Henry said, "That's not really a bokken. It is a 3-foot razor blade," then he asked, "So, how long would you like to stand still inside uke's reach?" Tori should never add speed or energy to an already hectic encounter. Tori's job is to use offbalance (not muscular power) to slow uke down to a manageable speed - not to speed uke up until he goes totally out of control. Don't pour gasoline on a fire. Make your move when uke is not capable of observing it. 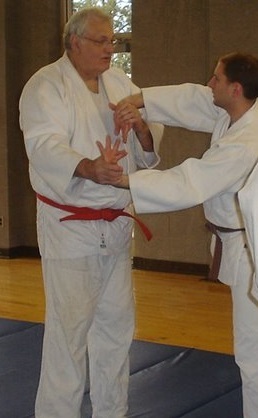 Some of the most terrifying budo that I've worked with anyone was doing tachi-tai-tachi with Henry. A lot of this was because he appeared to be able to teleport. When I finally got him to explain how he did this, he said as you raise your sword from chudan to jodan to get ready to cut, there's a time when your own forearms are blocking your vision. Henry could move during that time and the effect was so disorienting and startling that uke would often freeze up. Another example is shomenate - if you bring your hand upward right along uke's body instead of attacking frontally, uke's nose and chin obscure his ability to see your hand and forearm. Henry made great use of tricks like this as amplifiers of his technique. Henry showed me a koshiguruma years ago that was very similar to Matl Sensei's magic that I wouldn't see until years later. That had an interesting effect on my understanding of guruma in both judo and aikido. Henry is constantly demonstrating that magic is possible. Several times in suwariwaza, he projected me off my knees into the air with kotegaeshi, and there was never a feel of muscular power - certainly not enough power to knock a kneeling guy upward three feet into the air. He spent a lot of time trying to convince us that the things we were doing would work on a big strong guy if we behaved according to the above points but it would fail dramatically if we did not.